1. Preheat oven to 425°. Stir together first 2 ingredients in a bowl. Add bread cubes; toss to coat. Bake cubes in a single layer in a jelly-roll pan 3 to 5 minutes or until golden, stirring once. Cool completely on a wire rack (about 15 minutes). 2. 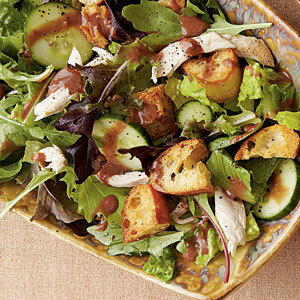 Combine spring greens, next 3 ingredients, and toasted bread cubes in a serving bowl. Process vinegar and next 6 ingredients in a blender until smooth. Serve with salad.